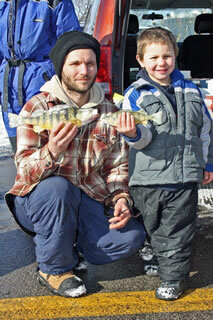 ELIGIBILTY: Everyone is welcome to fish as this is a license free weekend, (no fishing license is needed). 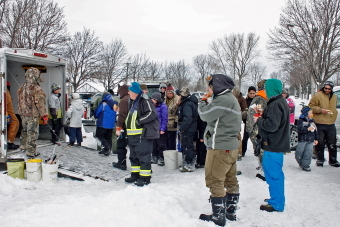 You must purchase an entry ticket before you start fishing. 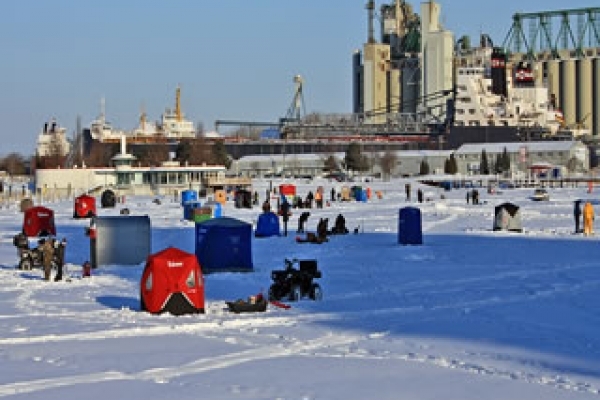 Deadline to purchase a ticket is 9:00am Saturday Feb 16,2019. 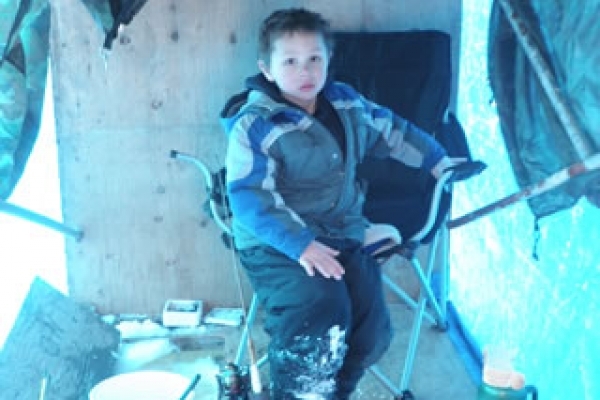 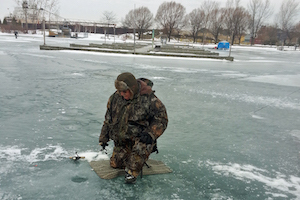 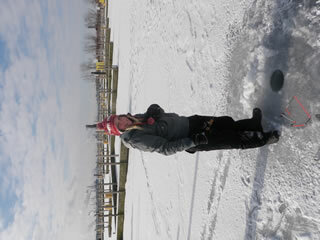 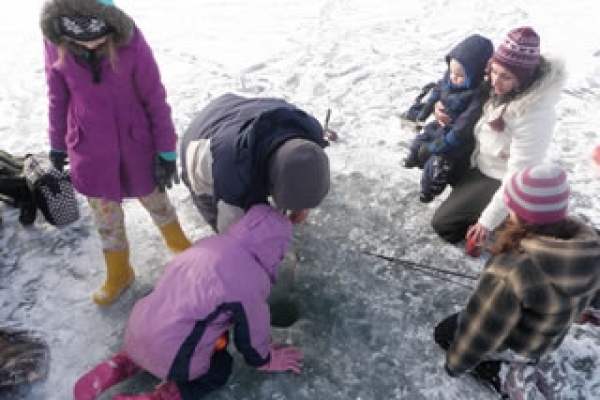 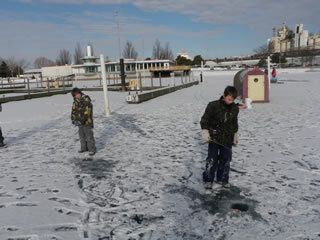 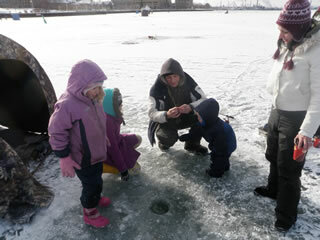 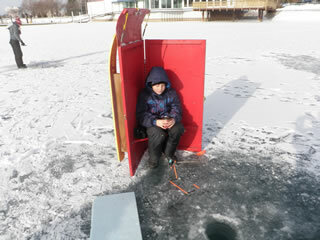 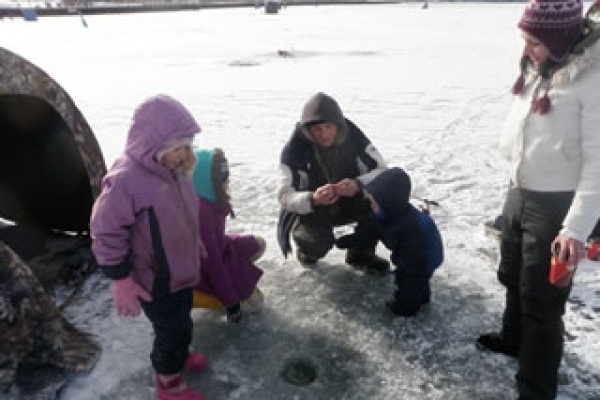 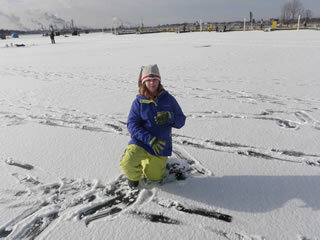 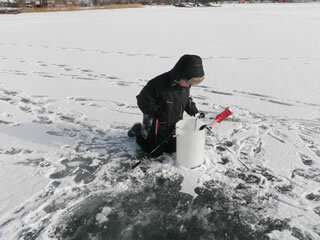 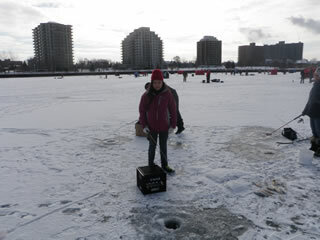 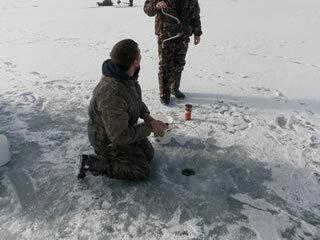 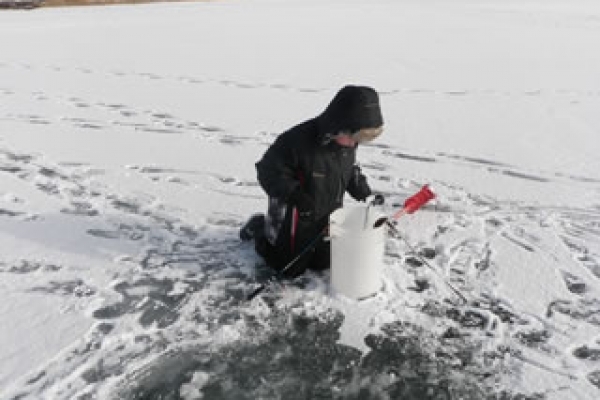 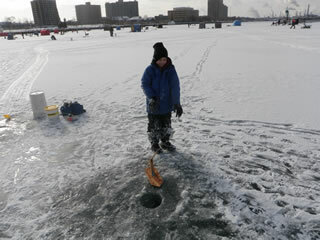 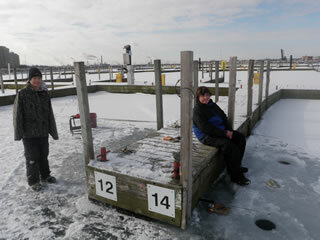 ALL FISH MUST BE CAUGHT THROUGH THE ICE. 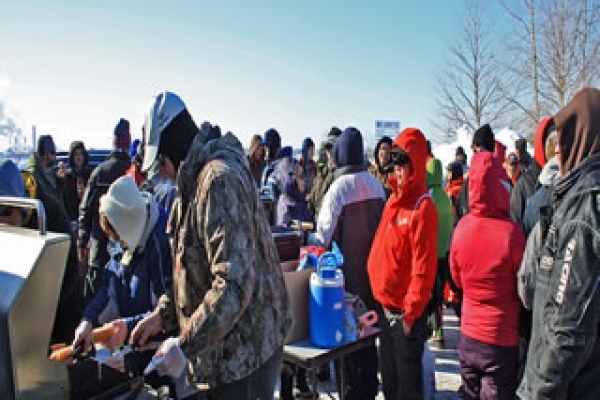 ENTRY FEE: An entry fee of $5.00 per person must accompany the entry form. 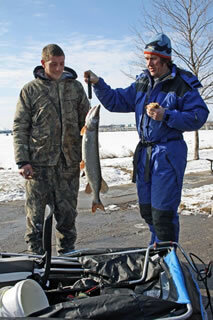 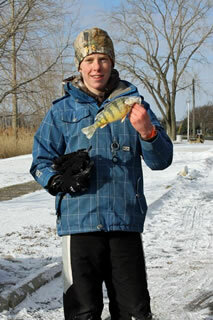 BOUNDARIES: All fish must be caught within the boundaries of the City of Sarnia and/or the Village of Point Edward. 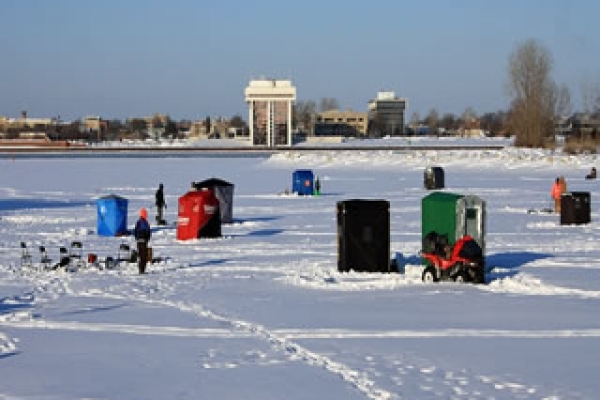 In case of inclement weather or unsafe ice conditions, the derby will be cancelled. 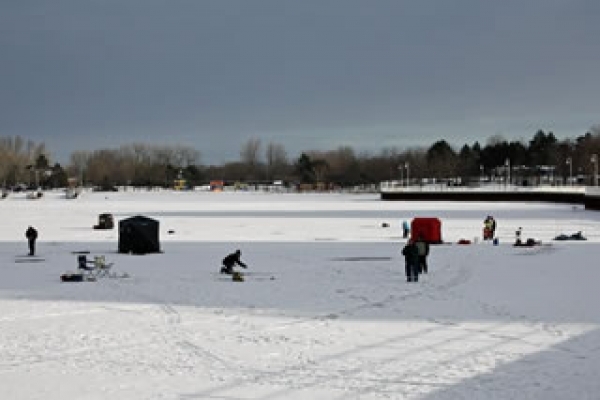 There will not be an alternate date. 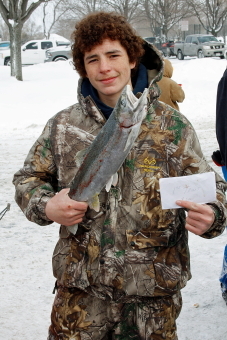 Prizes: Kids and Adults divisions. 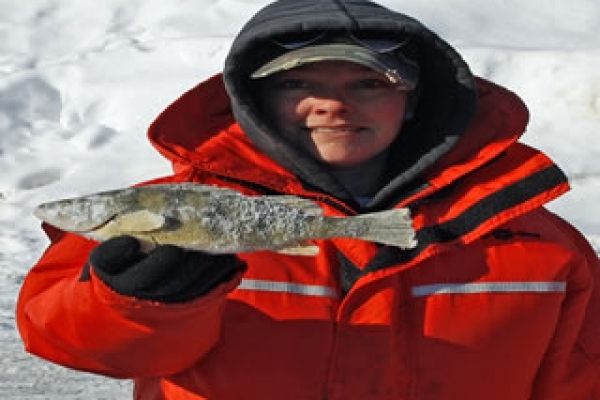 You are allowed to enter only one fish per category. 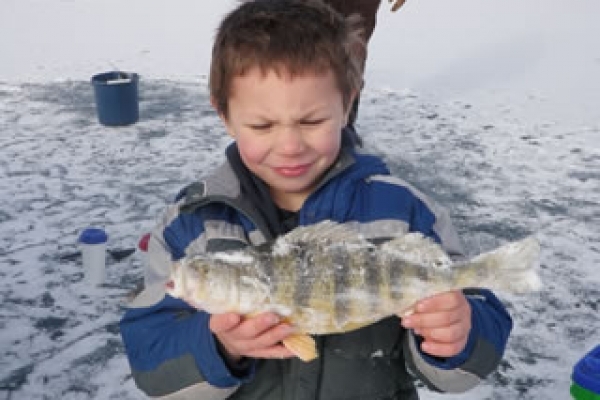 If No Fish are entered in a category, that fish category is deferred to the Panfish category, therefore the panfish category would add more places for payout. 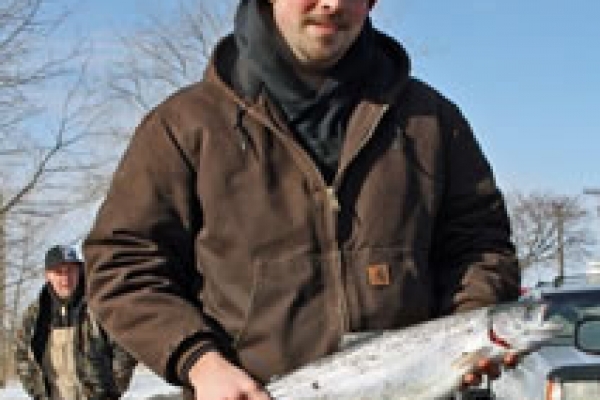 Eg. 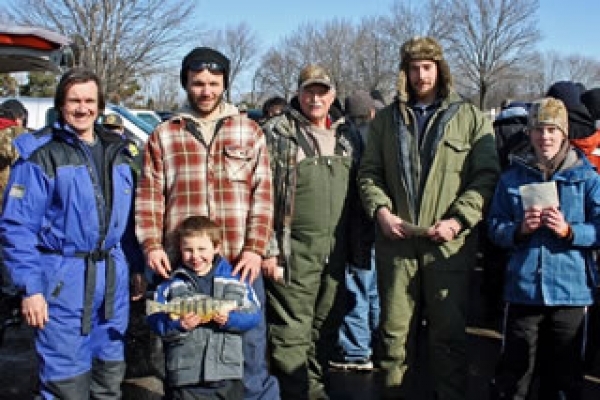 If no pike are entered, then panfish will pay out the top 6 spots, 15% for 1st and 2nd, 10% for 3rd and 4th, 5% for 5th and 6th. 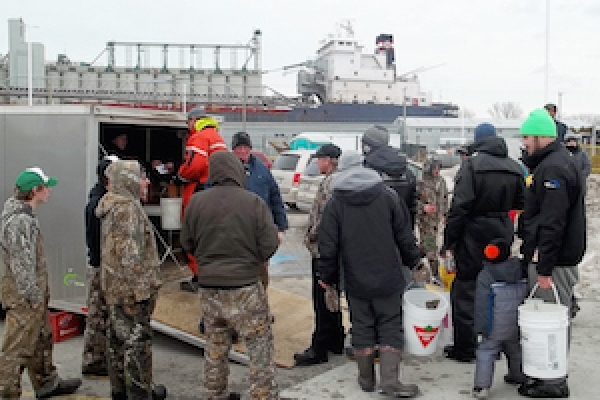 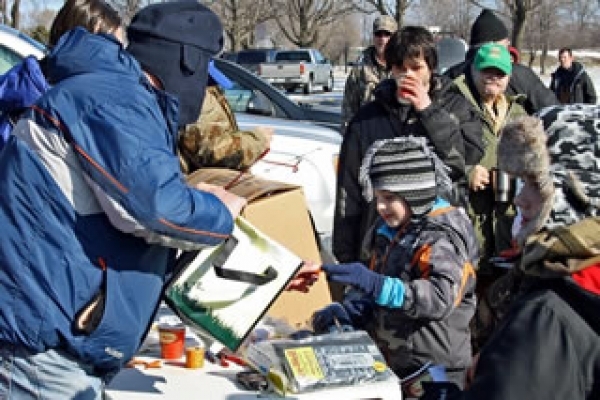 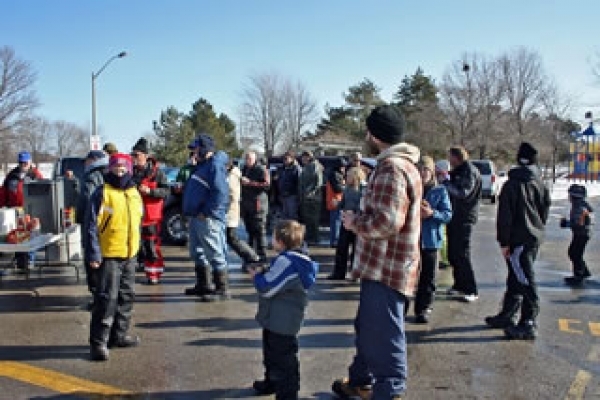 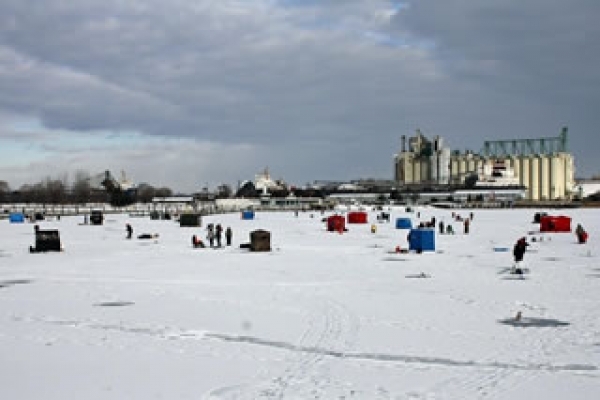 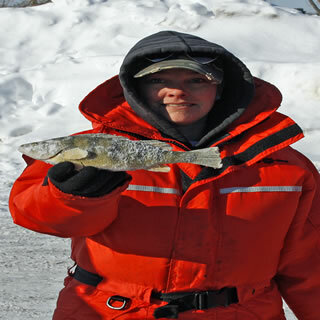 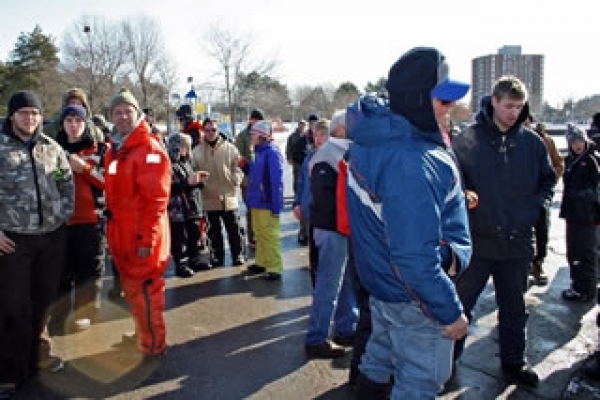 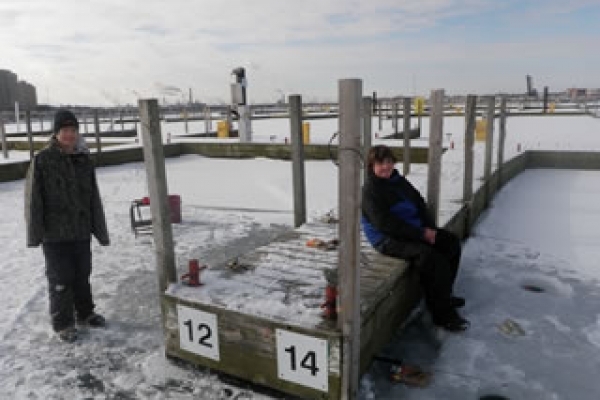 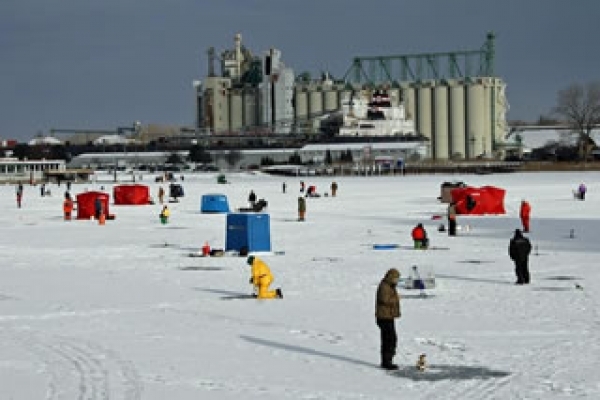 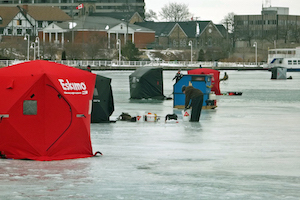 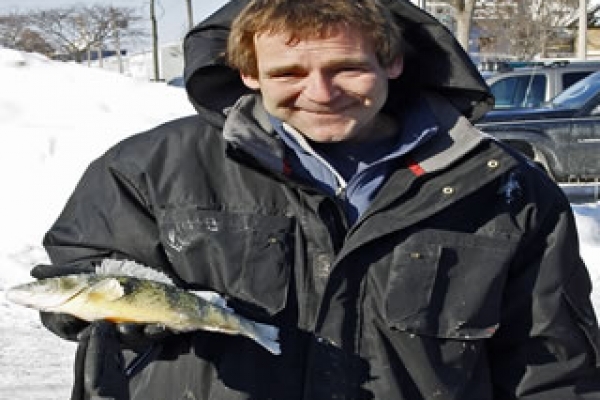 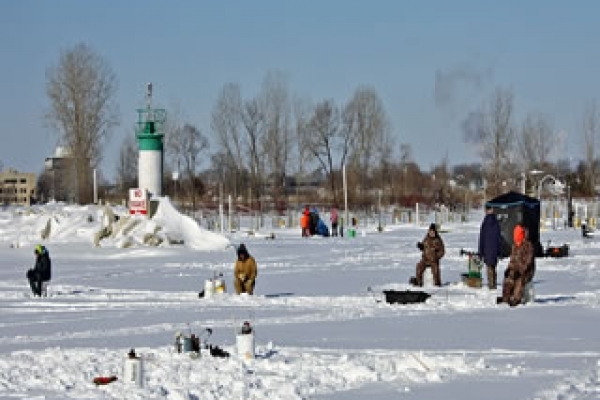 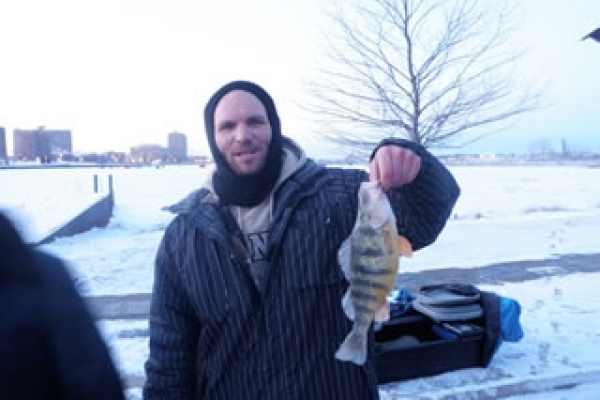 Participants must bring their catch to the weigh-in station located at the Centennial Park boat ramp parking lot at Sarnia Bay. 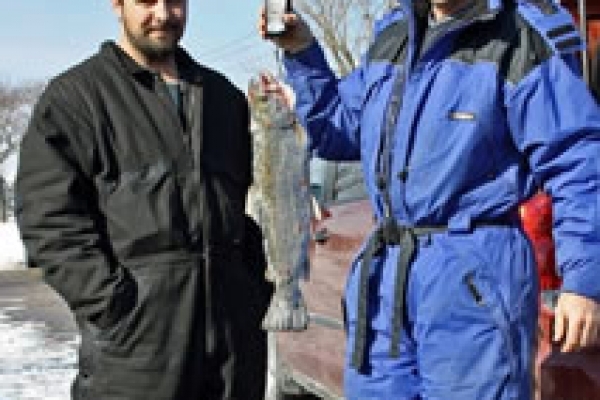 Fish must be weighed in by 11:00am. 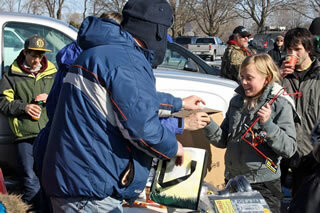 Prizes will be awarded right after the weigh in closes at 11:00 am. 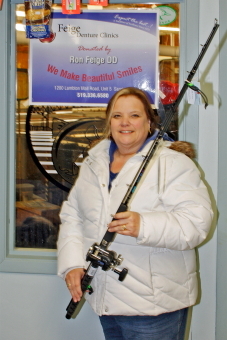 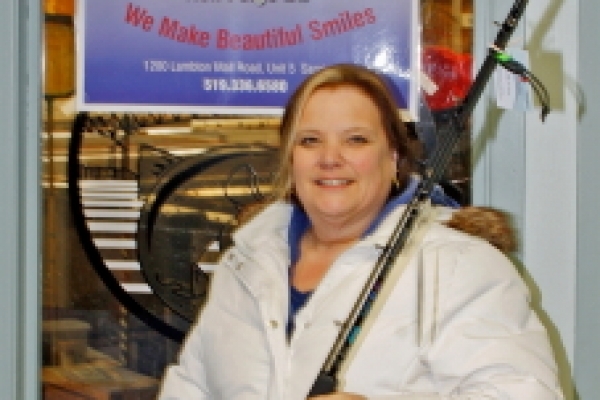 Prizes not claimed at prize presentation will be forfeited to the Bluewater Anglers. 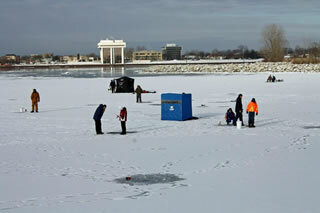 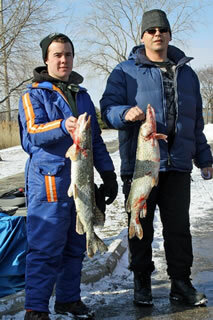 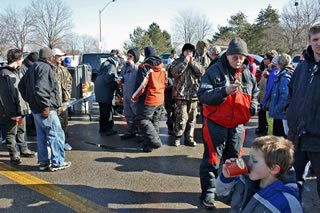 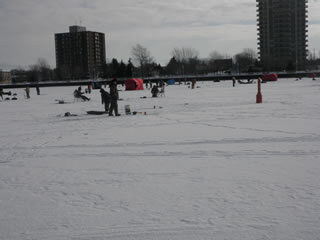 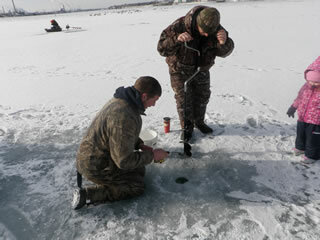 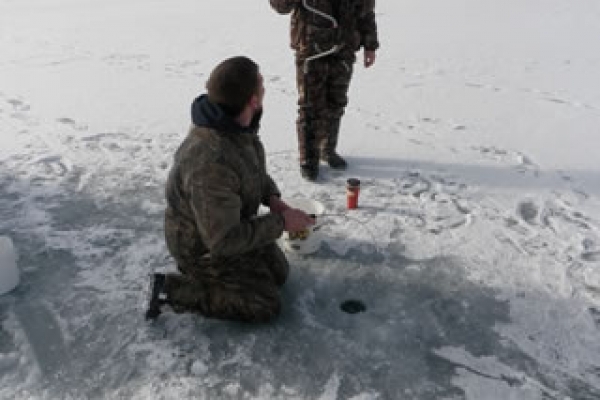 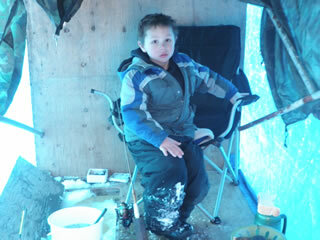 Bluewater Angler Members will be available to drill holes. 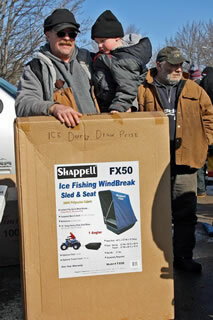 A minimum of 5 draw prizes will be made from entrants 13 and over that are present at the close of weigh in. 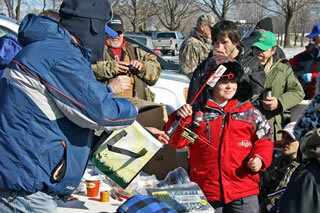 A minimum of 5 draw prizes will be made from entrants 12 and under that are present at the close of weigh in. 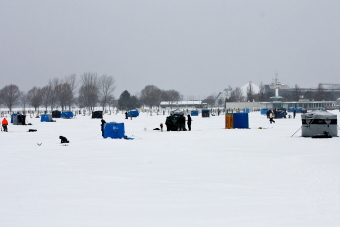 If derby has to be cancelled, a draw for prizes will be made from tickets purchased and winners contacted. 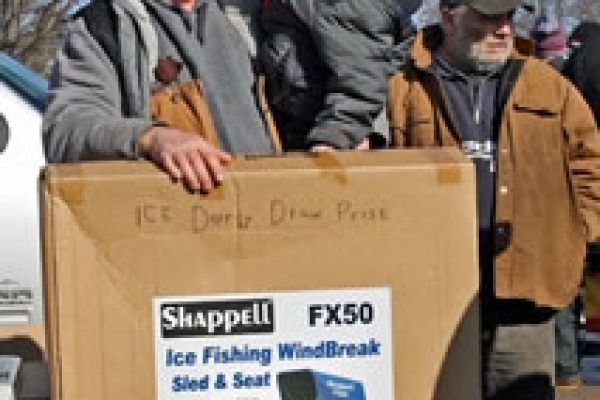 Prizes to be picked up within 30 days. 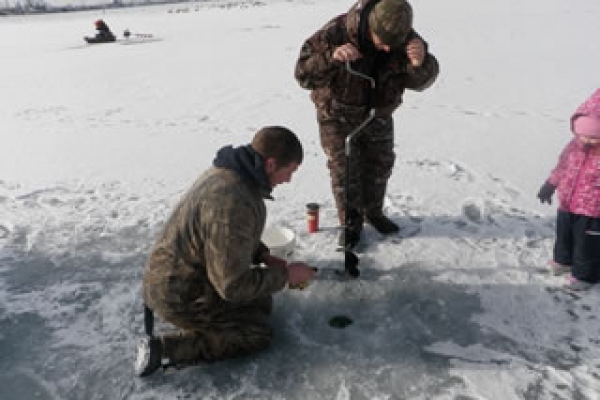 REMINDERS: Muskie, Smallmouth and Largemouth Bass are out of season, and should be released immediately back to the water. Please do not leave garbage behind on the ice. 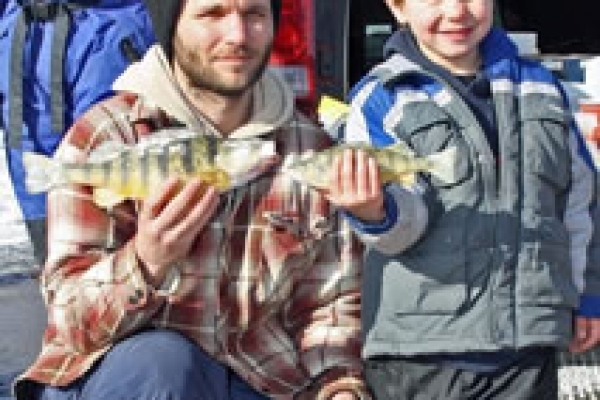 This puts future fishing in jeopardy for everyone. 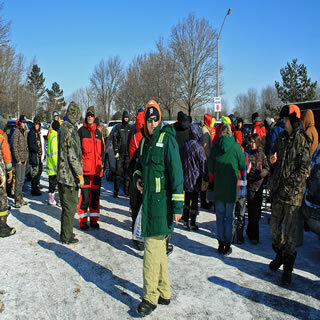 This association will not be liable to or for the loss of property or for injury to the person of any contestant or spectator. Contestants compete in this derby at their own risk and agree to hold this Association and members harmless from any liability, claims and cost of any nature whatsoever. 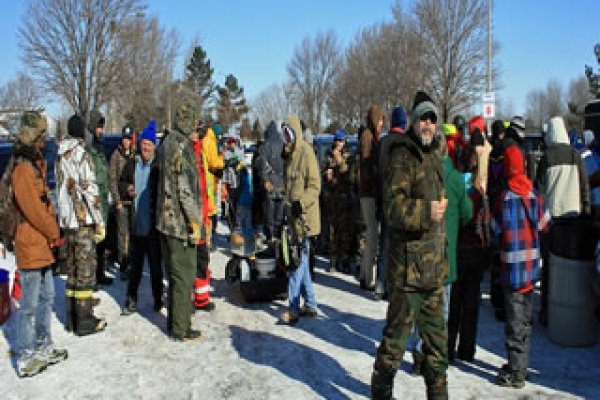 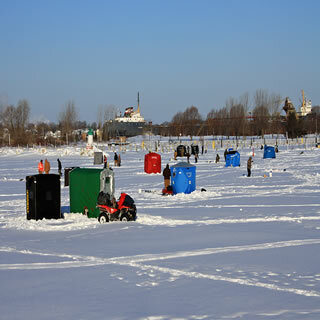 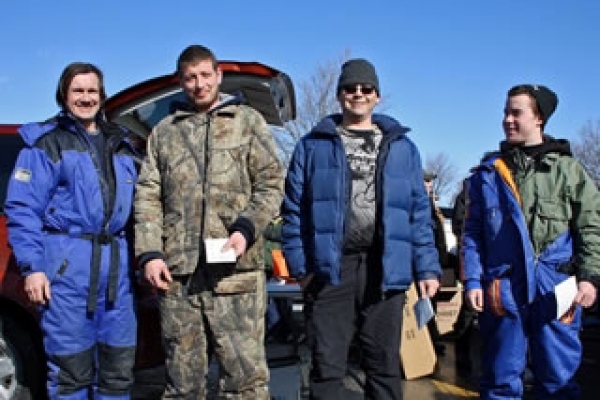 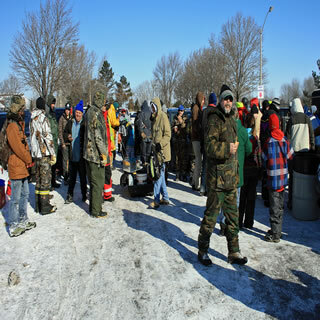 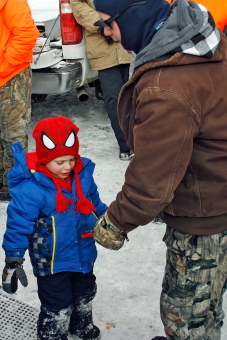 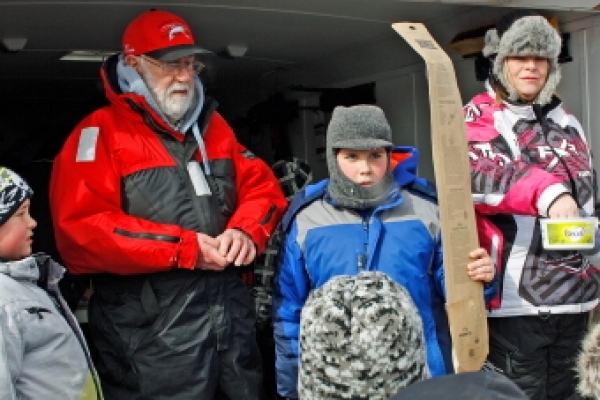 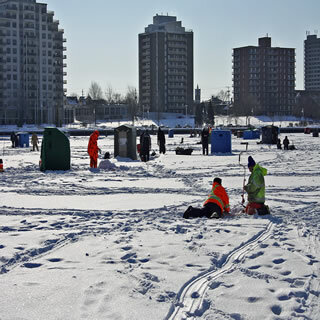 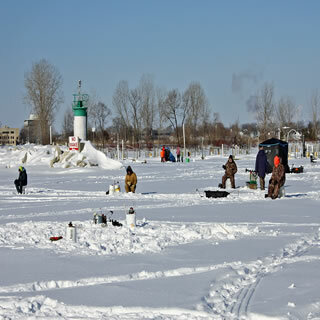 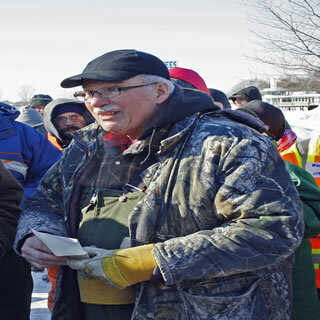 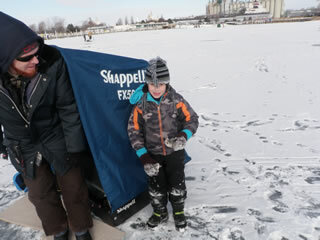 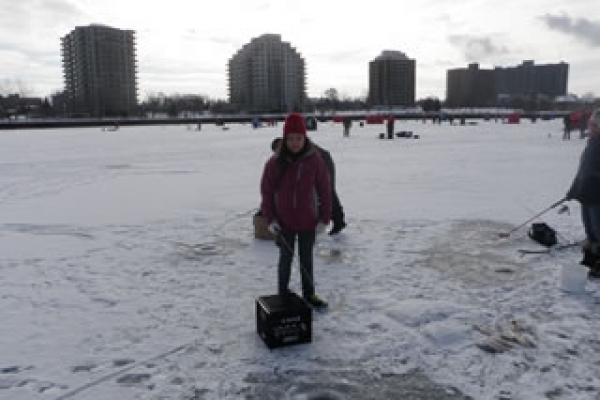 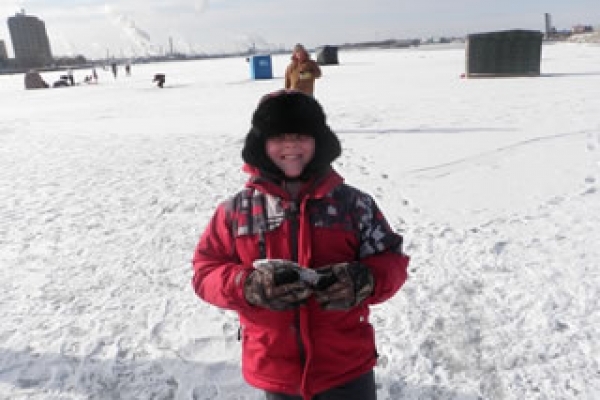 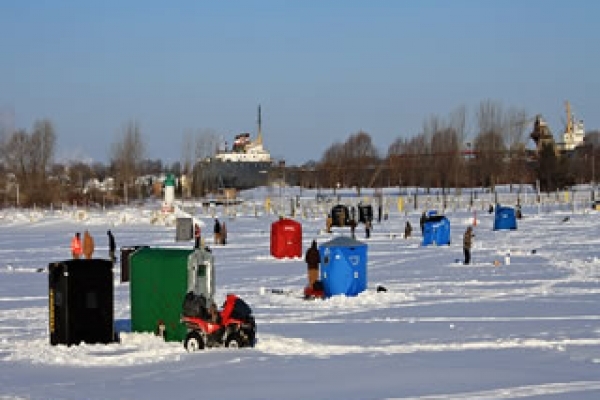 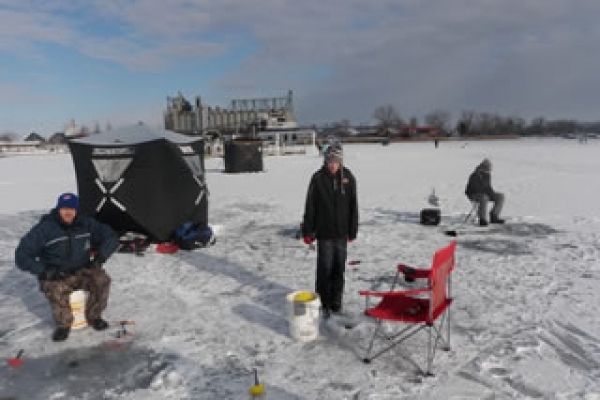 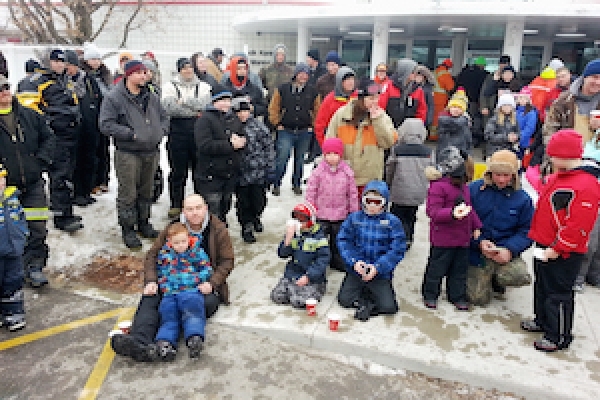 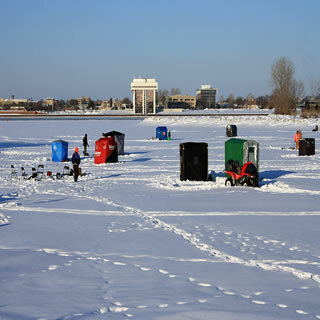 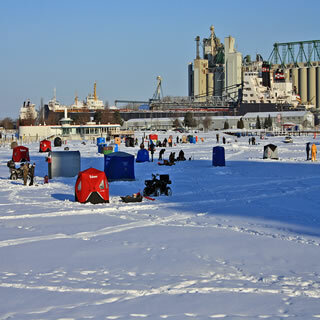 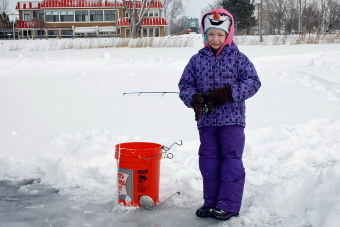 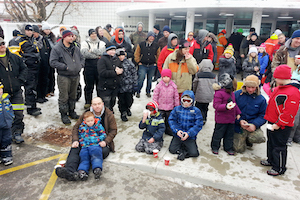 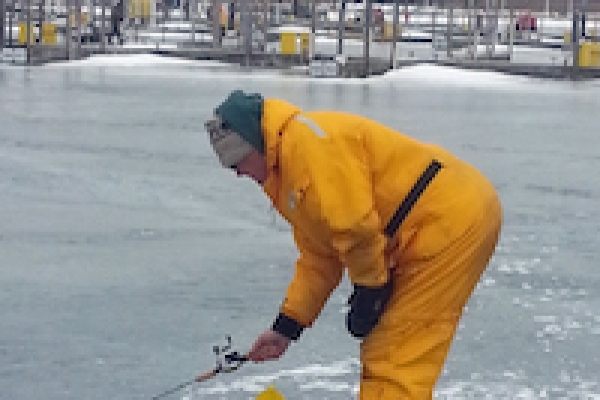 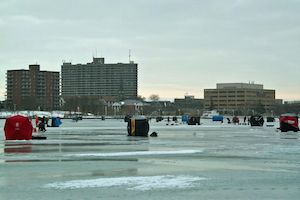 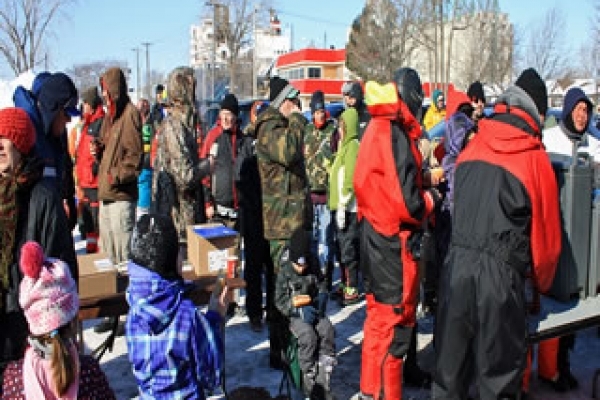 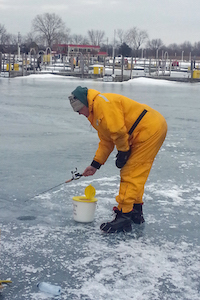 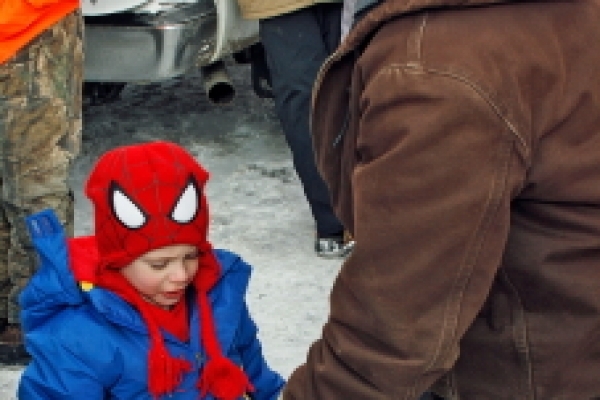 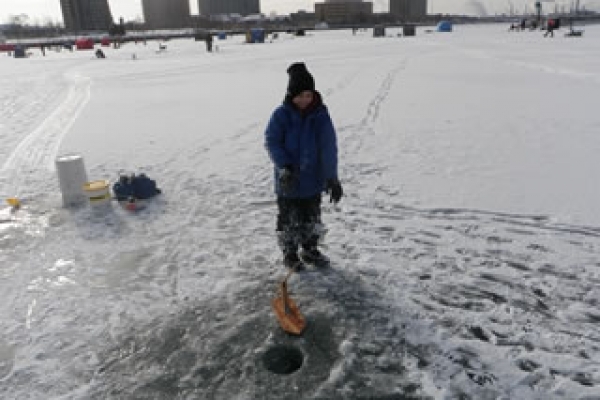 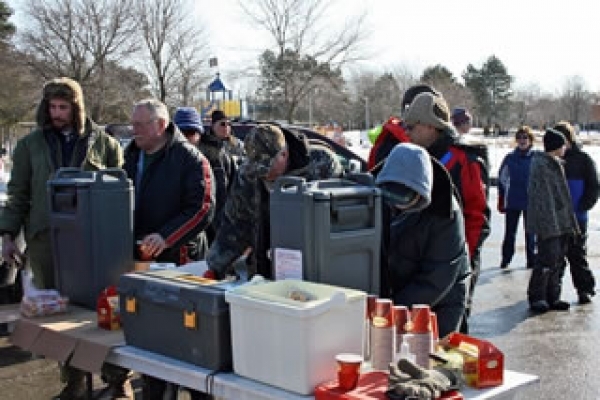 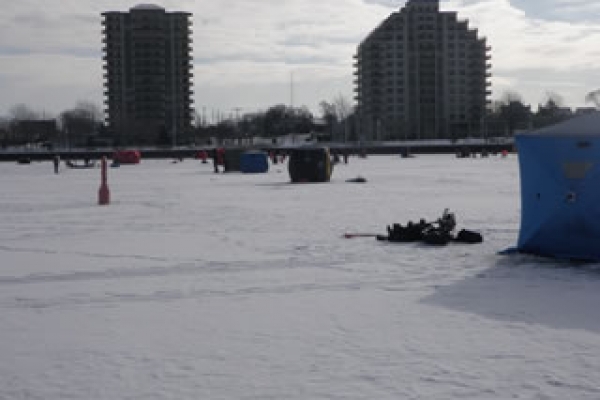 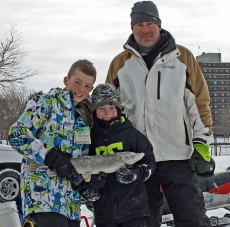 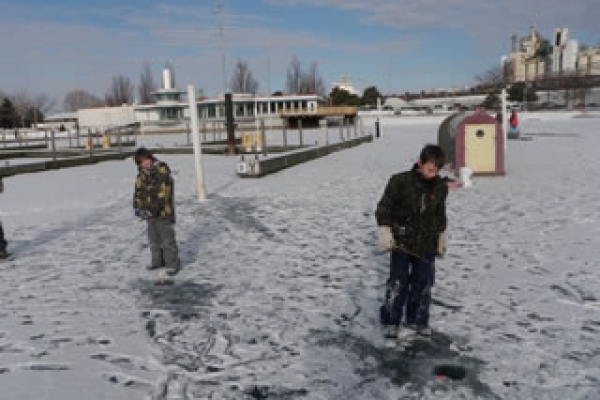 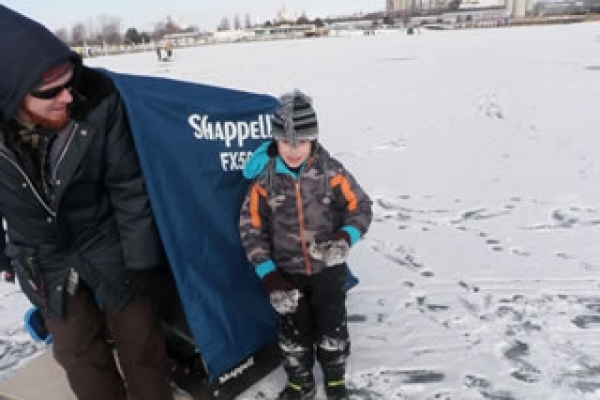 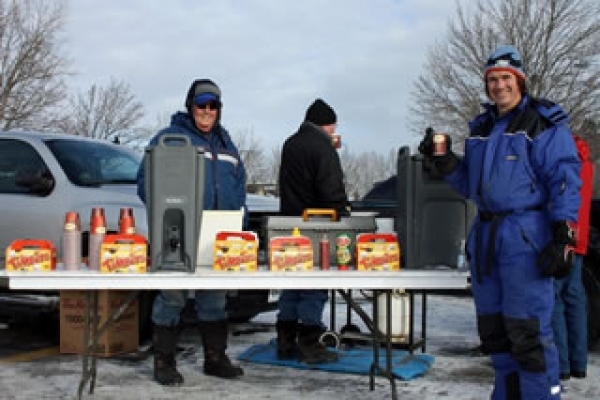 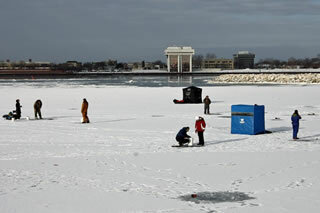 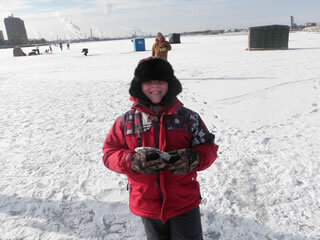 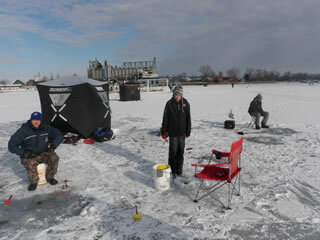 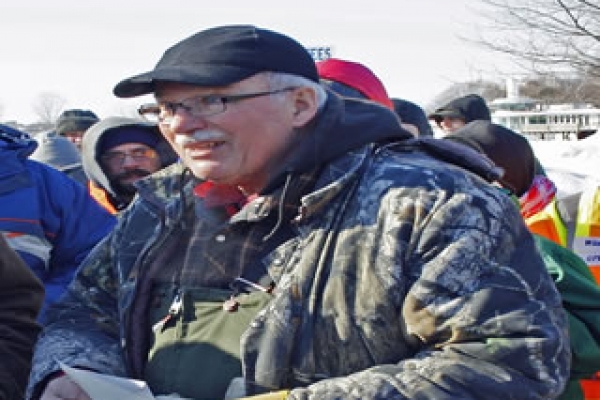 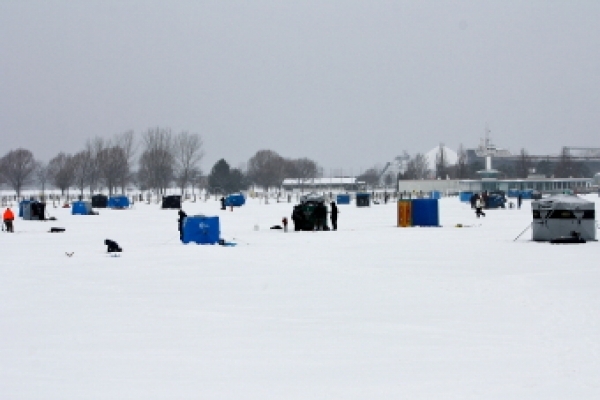 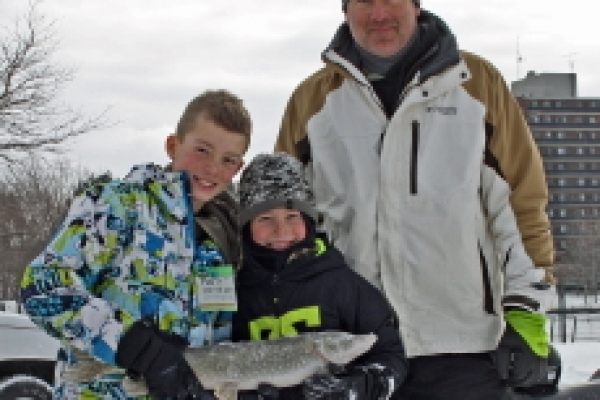 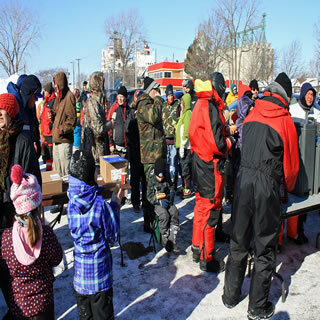 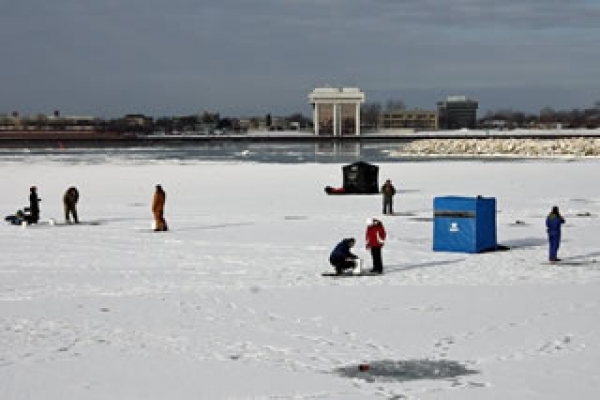 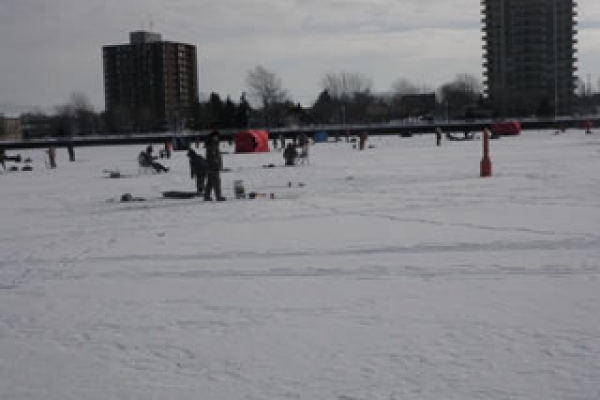 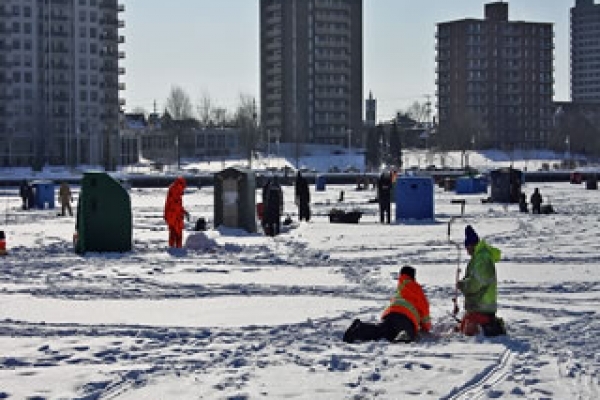 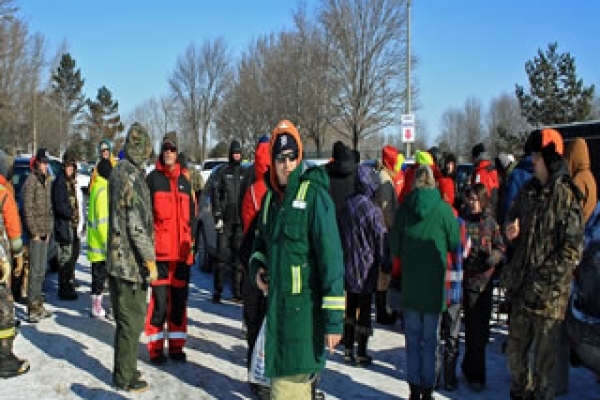 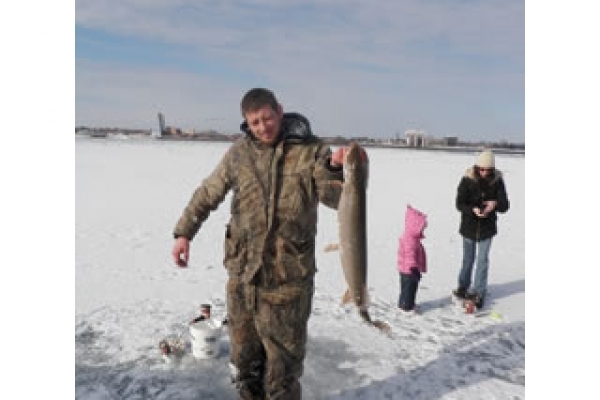 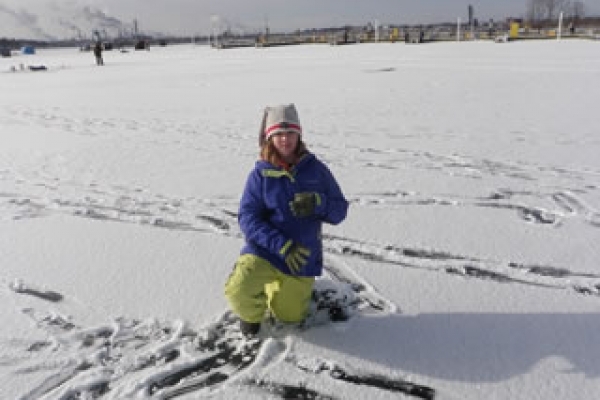 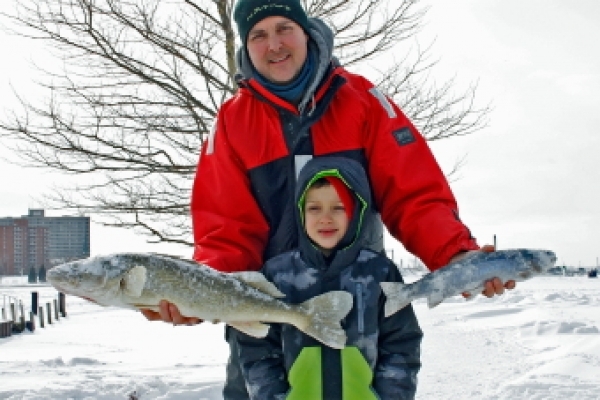 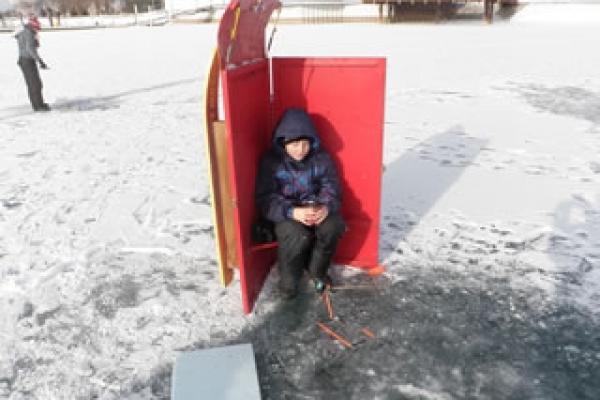 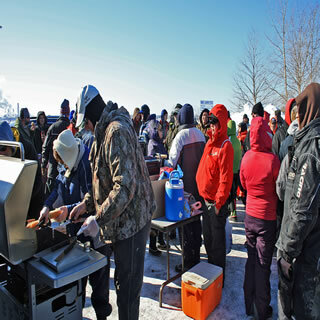 Almost perfect weather and ice conditions set the stage for the 2018 Bluewater Anglers ice fishing derby. 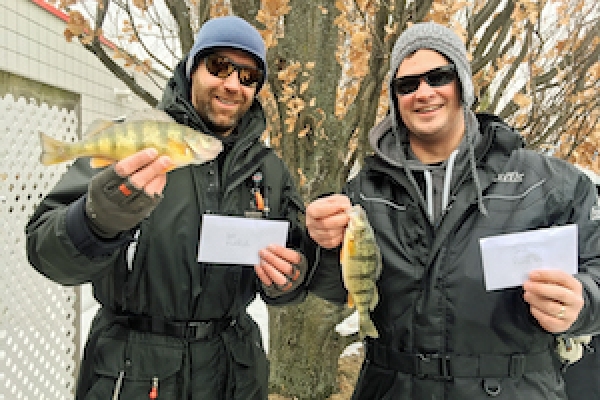 300 tickets were sold for the annual event that hadn’t been held since 2015 due to poor ice conditions. It was a record crowd! We had many volunteers show up to help with ticket sales, drilling holes, and cooking the hotdogs. 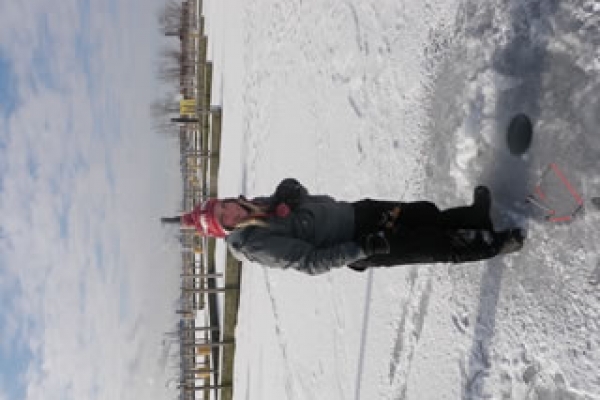 To all of you I would like to say Thank You! The Bluewater Anglers would also like to Thank the Outdoorsman and Buck’s Bait for their continued support with ticket sales, prizes, and bait. 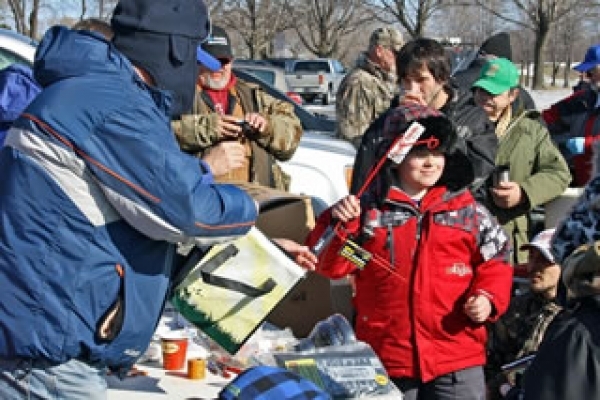 You have helped make this derby a popular family event! 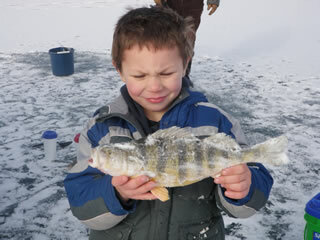 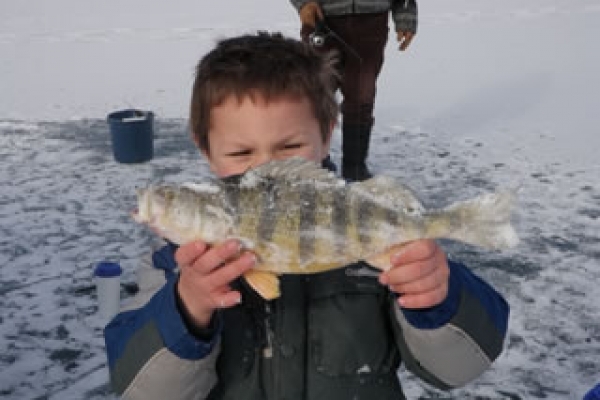 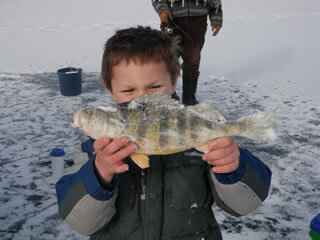 PANFISH 1) Dino Evangelista – 11 1/8th inch Perch $225. 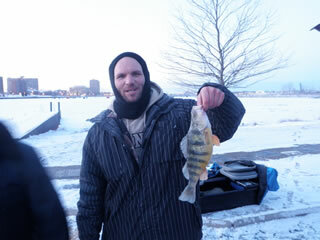 2) Rob Myloyja - 11-inch Perch $135. 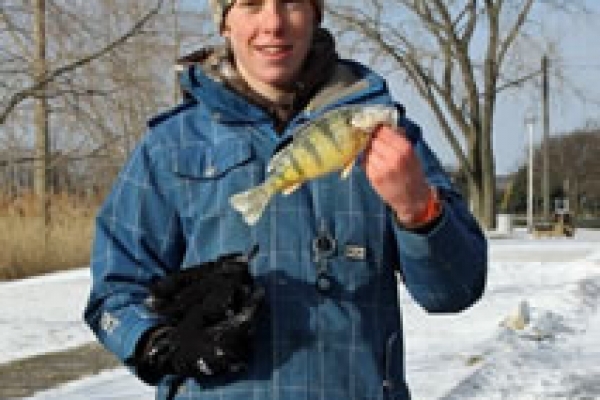 3) Harry Harris – 10 3/8th inch Perch $90. 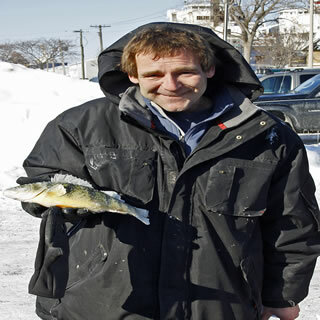 4) Kevin Taylor – 10 ¼ inch Perch $90. 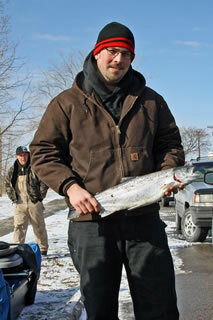 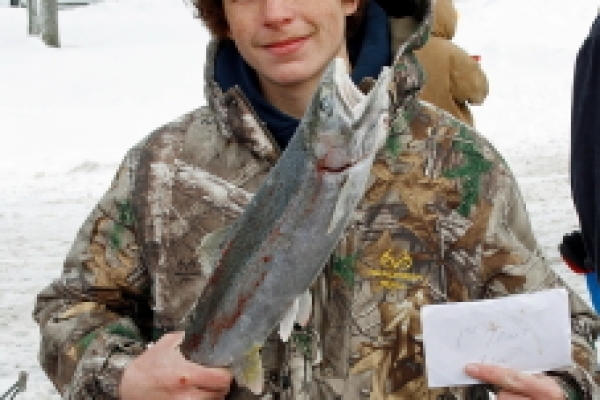 TROUT/SALMON 1) Dalton Collins - 5.1-pound Brown Trout - $ 225. 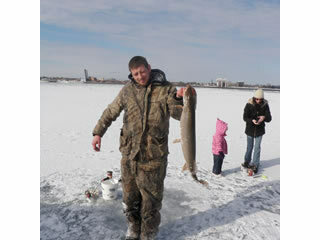 PIKE/WALLEYE 1) Nick Dirzze – 9 pound Pike $225. 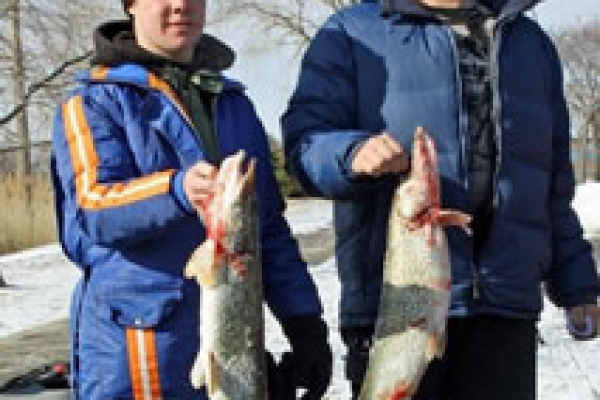 2) Scott Dezort – 6 pound Pike $135. 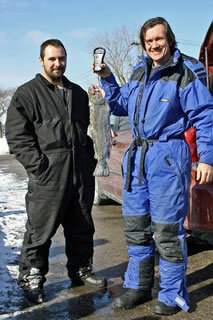 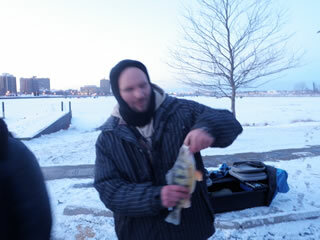 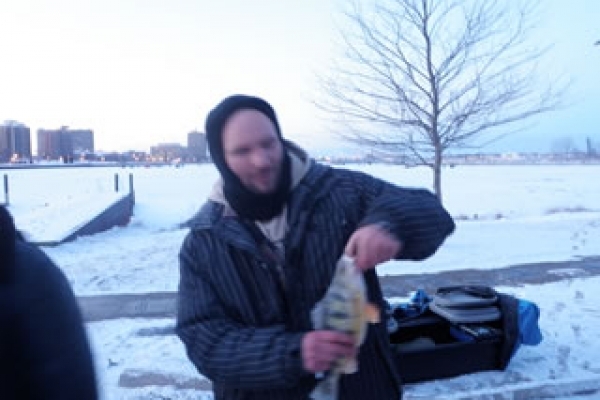 3) Josh Craig – 3.5 pound Walleye $90. Weather network picture of the ice derby. 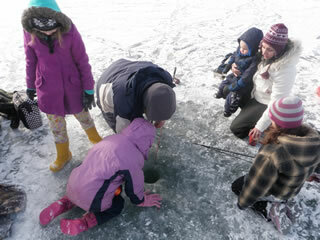 Select other years (above pictures) to view more images.